A young Japanese boy sits on the bough of a willow tree, playing the flute, at ease in the world, anchored to the transcendent power of the sacred mountain. 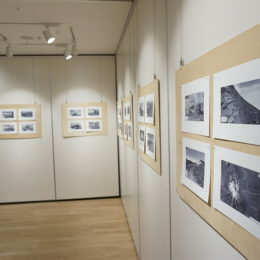 Is it still possible to experience the transformative sense of connection to place represented in Hokusai’s 1839 painting Boy Viewing Mount Fuji, while you’re sitting in 21st century urban spaces framed by freeways, shopping malls and industrial estates? 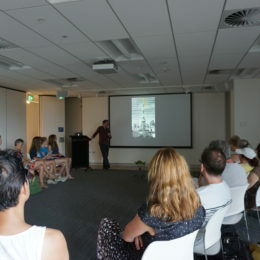 Artist Michael Garbutt’s Thirty-Seven Views of Fuji responds to this question by documenting his experience of “sitting-as-art” on the streets of Sydney and in the virtual world of Google Street View. 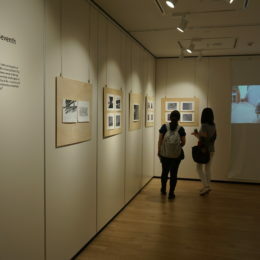 In this conceptual art exhibtion inspired by Hokusai’s boy, exhibition visitors are invited to take time out to cast their own gaze in the direction of Mount Fuji.